Although the quote is often seen in military circles, it’s relevant in the business world for the same reasons your professors all keep quoting Sun Tzu at you… capitalism is a kind of war, competition is a sort of battle, and the things that the military mind has been studying and perfecting over thousands of years are often equally true (though less bloody) in the context of commerce. That’s also why an MBA with a concentration in supply chain management can be one of the most valuable business degrees. While operations, marketing, and accounting all have their parts to play in the business world, nothing of any importance happens without basic supplier and product fulfillment. Factories grind to a halt, store shelves go empty… production and sales quotas go unmet. It’s a complicated business and the extra education that comes with a concentration is highly valued in modern corporations. But not every MBA in supply chain management is created equal. Every university in the United States worth looking at has at least a basic accreditation from one of the major regional or national accrediting organizations recognized by the Council for Higher Education Accreditation (CHEA) and the U.S. Department of Education (USDE). Like the mainstream accrediting agencies, these three organizations all spend a crazy amount of time and energy digging into the details of a business school’s curriculum, faculty, and administrative elements. Getting their approval is usually a multi-year effort that involves on-site visits, observations, and truckloads of paperwork (they probably have to hire their own logistics professionals just to manage it all!). The big difference is that they drill down specifically in the context of business training. Looked at the research practices, teaching skills, and subject matter, the business accreditors ensure that the programs they validate remain aligned with the current and evolving demands of the American business community. Full accreditation, both from general and specialty accreditors, is only the barest minimum you should look for, however. When it comes to an investment like an MBA, you want to make sure you are getting the best value and the right kind of schooling to match your career objectives. Our list goes way past just the accreditation and dives into the other factors that make a logistics specialization valuable. First and foremost was whether or not the program was strong on the realities of modern supply chain management. So many supply chains are international, or are impacted by international logistical factors, that we heavily weighted program that have global studies options. Not all your suppliers are going to speak English and not all your parts are going to come in on an eighteen-wheeler. You have to be prepared for the cultural realities of transnational commerce and transportation modes. We gave special consideration to any program that made an international component central to the program. We also looked for programs that embraced technology. In fact, all of the entries on our list have at least some options of taking online or hybrid courses. It’s just one indicator that a school is comfortable enough with information technology that you can count on them to cover the latest high-tech developments in supply chain tracking and oversight. In an era where blockchain and RFID are sweeping into logistics programs, you need to pick a school that has moved away from clipboards and binders. Another factor we considered was industry relationships. These, in turn, were often driven by region… schools located in or near port cities, or around major manufacturing centers, tend to have partnerships with and internships at major global shippers. That’s important for hands-on, experiential learning opportunities, and something we feel is very important for any SCM grad student to have exposure to. There are also usually high-quality faculty with recent logistics experience attached to such schools, and strong, diverse alumni networks to provide support and connections after you graduate. Finally, we looked for little extras that enhance the logistics education at the school. A center for international business, special leadership programs, guest lecture series… anything to give you that extra edge you need to get ahead in today’s international supply organization. So here you have it – our pick for the very best online MBA programs with a focus in supply chain management. You can be confident that any program you might select from this list is well worth the investment of your hard earned money. Simply put, Ashford is the leader in online learning. So, when considering a fully online MBA program that examines the intricacies of logistics management, their MBA in Supply Chain Management program can’t be beat. In this robust course of study, you’ll take one, six-week course at a time through their cutting-edge virtual classroom. You’ll learn from a faculty who serve as both instructors and mentors. You’ll enjoy an asynchronous learning format, which means you’ll set your own schedule and study whenever and wherever it’s most convenient for you. You’ll be able to access your schoolwork from your phone, tablet, or desktop computer, and you’ll engage with your peers through discussion boards. Through Ashford’s interactive platform, Constellation, you’ll be able to access all of your digital course materials in one, convenient location, making distance learning easier and more convenient than ever. Add to that 24/7 tech support, access to the Library and Writing Center, and a student-to-faculty ratio of just 13:1 and it’s easy to see why Ashford University comes out on top for its MBA program. Ashford University is accredited by WASC Senior College and University Commission (WSCUC), 985 Atlantic Avenue, Suite 100, Alameda, CA 94501, 510.748.9001, www.wscuc.org. When looking for an MBA program with a strong supply chain management concentration, it’s always a good idea to look for schools that have strong international studies programs and ties overseas. Supply chains are long and winding these days, crossing borders, oceans, and cultures. If you want to be an effective manager, you have to understand all those elements, and at a school like the University of San Diego, you’ll learn about them from experts. The supply chain management concentration covers business cycles and forecasting, strategic cost management, and supply management topics, just like you’d expect with a logistics-oriented track. But it also goes into negotiations and sustainable global supply chains, touching on aspects of culture and commerce conducted outside the normal American paradigm. Study abroad options through the Ahlers Center for International Business help you get outside the classroom and to actually experience some of the cultures you may deal with in the professional world. A strong emphasis on global law and ethics in the core curriculum helps you understand the regulatory issues involved. Experiential learning opportunities then allow you to put all those elements into practice in a real business environment, either through school-mediated consulting engagements or internships. Operations and supply chain management is a dynamic, high-tech field today, so it’s perfect to find a program where you can learn the ropes using some of the same flexible, fast-paced, mobile-friendly approaches that you’ll find after you graduate. CTU is a technical university in practice as well as in name, so you are getting an exposure to cutting edge tools as well as techniques in their Operations and Supply Chain Management MBA concentration. Courses in inventory control and distribution, operations strategy, and operations management all come together with the core MBA courses in your management capstone course, where you and a team of fellow students pull it all together in a stressful, educational business simulation under the watchful eyes of experienced faculty. The Quinnipiac Flexible MBA revolves around the hardest of business skills to master: decision-making. Teaching the knack of assimilating relevant information, analyzing it, formulating options, and making firm, consensus-lead choices is a specialty, and it’s one that is particularly relevant if you take the superb supply chain management track option. Global business moves at a breakneck pace and international supply chains can experience every kind of disruption at a moments notice. With a strong background on product lifecycle, sourcing, and logistics considerations, you’ll leave Quinnipiac with the information you need to inform split-second decisions in the real world. And with team-based projects and real leadership experience under your belt, you’ll also have the mental skills to execute them at the highest levels of business. Are you looking for the finest in online learning to take your career in organizational efficiency of the supply chain to the next level? Look no further than Nova Southeastern University’s MBA in Supply Chain Management, a robust program designed specifically for adult learners like you. Thanks to a fully online course delivery, you can study whenever and wherever it’s most convenient for you. But don’t mistaken this distance learning program for being less than superior. Nova Southeastern is home to the largest MBA program in Florida, and its programs feature a relevant and robust curriculum that’s been designed with input from top corporate executives. In addition to a comprehensive MBA core, the MBA in Supply Chain Management will allow you to explore everything from managing international transportation and logistics to managing customer and supplier relationships to supply chain strategies—all of which easily translates into the real world. With both part- and full-time options and five start dates throughout the year, Nova Southeastern’s MBA in Supply Chain Management is all about flexibility and convenience for busy working professionals looking to take their careers to the next level. Outstanding resources for advising, career services, and student life include student advisors to help you throughout your journey and Career Services professionals to support your professional growth and career advancement goals. An in-depth study into the best practices for the selection, development, alignment, and enhancement of integrated global supply chains is at the heart of Saint Leo University’s MBA in Supply Chain Global Integration Management. And while you’ll get an outstanding education in creating the most flexible and reliable supply chain for today’s globally minded businesses, you’ll also receive a superb education in advanced business techniques, thanks to the program’s robust MBA core. That means an education rich in financial and managerial accounting, marketing, strategic management, and HR management. But there’s more. This program is designed to be completed entirely online, thereby accommodating the busy schedules of working professionals like you. Available through Saint Leo WorldWide, your learning can take place wherever and whenever it’s most convenient for you. As an online learner here, you’ll enjoy the same, rigorous course of study as the program’s on-campus students, and you’ll be taught by an accomplished faculty who are both experienced practitioners and experienced instructors in online learning. You’ll always feel connected through Saint Leo’s WorldWide Student Services Department, which includes resources for advising, career services, and student life. Student advisors are there to help you throughout your journey, while Career Services professionals support your professional growth and career advancement goals. Albany State believes in creating a community among students and faculty, not just treating students as a passive audience to be lectured to. If you like getting your hands dirty and directly engaging with both passionate faculty and working businesses, then this may be the place for you. CALM, the Center for Advanced Logistics Management, is a recognized leader in supply chain consulting and educational services. As an MBA student at the school, you have the opportunity to learn real-world lessons through engagements there. The school has close ties to military and government services, which is a real advantage for supply chain studies… no-one knows logistics like the military knows logistics. You’ll be learning from professionals who are considered competent enough to make supply chain decisions and plans when lives are on the line, which is more than good enough for shipping widgets in any industry you might join. Get in on the ground floor of this brand new program, launched in 2018! Clayton’s new online MBA offering is just getting off the ground, so it doesn’t have a lot of the accolades that other, older programs have accumulated yet. On the other hand, it isn’t saddled with any of the baggage that comes from old technologies or old formats, either. You can spot this advantage right off the bat by looking at the way the supply chain management concentration coursework is woven directly into your course of study. Unlike other programs, the classes aren’t tacked on at the end like an afterthought. Instead, almost from the start you are diving into your chosen specialty and learning how the important elements of logistics tie in with accounting, economics, and questions of strategic management. Complex supply chains have become an integral part of the global business environment. The efficiencies introduced by site-specific manufacture and differential labor costs are too great for any company to ignore for long. That’s sent the demand for supply chain experts soaring. With an MBA in supply chain management from GSU, you can be ready to join those ranks in as little as 18 months. You’ll learn about global logistics realities and the strategic value of procurement and materials management. At the same time, you get the excellent grounding in economics, management, technology, and organization that every executive needs to understand. As a cutting-edge business program operating in the Chicago area, you know that you are going to get exposure to knowledgeable, expert faculty who have plenty of real-world logistical experience in thriving, active industries to pass along to you. Experiential learning is the focus in the supply chain management concentration. You’ll get a source-to-consumption perspective on logistics through a process of analysis and strategic planning, together with the project management education to put it all together and the transportation and economics data to pencil the numbers out. Supply chain management is one of the most widely supported and available concentrations at WIU, available online and at two different campuses with a hybrid option available. The diversity of courses available also works in favor of the specialization, with options covered everything from transportation and warehouse management to strategic sourcing strategies. A worldwide logistics and e-commerce course also covers everything you need to know to get up to speed in the global, interconnected environment that modern businesses thrive within. Worcester Polytechnic Institute designed their MBA with two open electives to let students build a course sequence in SCM by taking courses directly from the highly specialized M.S. in Supply Chain Management also offered at the Robert A. Foisie School of Business. STEM is hot in the business world today, as technology and engineering are radically transforming not just how business is done, but how we all live our lives. But high-tech doesn’t ever get away from the realities of business on the ground—you can’t program your way out of a customs hang-up with a load of cutting-edge graphics chips coming out of Hong Kong. For that, you need professional skills in supply chain management as well as top-notch engineering knowledge. And Worcester Polytechnic is where you get that golden combination of high-tech and practical know-how. Kettering has a solid reputation in engineering circles, which might have led you to discount their MBA program. But the combination of a rock solid core curriculum in accounting, finance, and strategy combined with the high tech acumen that pervades the school makes in the perfect choice for an MBA specialized in supply chain management. Technology factors heavily into modern supply chain tracking and distribution. You’ll get an education that integrates those technical factors closely with up-to-date enterprise resource planning and operations knowledge. You’ll also get courses in international business and designing value into supply chains, both important considerations in the modern practice of global logistics. First and foremost, UM Dearborn’s MBA program ensures that you will walk away with a strong understanding of the core principles of business and the skills to apply that understanding in a global business environment. That global emphasis is particularly important when it comes to supply chain management, and Michigan is a region that understands the requirements better than most. As the automotive industry has evolved, international supply chains have become the norm, and no one better understands the twisting regulations and requirements than expert faculty who have either consulted with or worked within that industry. You’ll get recent, real-world insights on strategic sourcing practices, lean and Six Sigma best practices, and the use of analytics and information technology to managed distributed, just-in-time supply chains around the world. While many students in the program may already be working in the auto industry, the curriculum will prepare you to land anywhere and succeed regardless of your industry. Logistics and supply chain management is a specialty area that is increasingly in demand both in corporate America and worldwide. That’s because logistics is increasingly a global concern, and if you’re going to earn an MBA with a concentration in supply chain management, then you’d better pick a program that gets you up-to-speed on international management considerations. UMSL delivers in spades; their international business program has been consistently rated among the best in the nation, a mark of distinction that reflects positively on the international emphasis in their logistics courses. A Global Management elective offers three possible choices to help put global business considerations in focus, and that’s before you even get to the specialized supply chain courses. When you graduate, you will do so with the tools and skills to put together effective, efficient supply chains both nationally and internationally. Webster offers 13 different areas of emphasis to their core MBA program, which offers a lot of ground to cover for specialists. But with their incessant focus on international perspectives and a commitment to small class sizes to make sure you are getting the most out of the program, the procurement and acquisitions emphasis is the one that offers the best bang for your buck. Logistics and supply chain management at other schools is often treated as a sort of bubble where a product is handed in at one end and spit out at the other end according the plans and calculations. But that leaves out many of the realities of forging local connections and negotiating the acquisition of the materials or products in the first place… all aspects that can have a real effect on the efficiency and efficacy of the resulting logistics train. Webster takes you through the whole thing from procurement to legal implications to pricing strategies, and then ties everything together with an integrated studies course that puts it all together with your core MBA learning in accounting, HR, and strategic subjects. Whether online or on-campus, Bellevue University’s MBA in Supply Chain Management is the robust degree program adult learners like you are looking for. With an emphasis on building and practicing the real skills you need to succeed in today’s dynamic business environment, the MBA in Supply Chain Management is where you’ll study a wide range of relevant and contemporary topics in business while you explore organizational efficiency topics like IT practices for managing the supply chain, the essentials of supply chain management in a global environment, and logistics management, thereby preparing you for careers in consulting firms, logistics service providers, manufacturers, and distributors. Thanks to Bellevue’s Real Mastery approach to learning, you know you’ll receive a solid education that immediately translates into the real world. And because Bellevue recognizes the importance of providing adult learners with a convenient and flexible learning environment, you’ll be able to complete this program entirely online. As an online student, you’ll enjoy a host of benefits, including: online tutoring…collaboration with your peers through online forums…an esteemed faculty of dedicated professors…24/7 tech support…and access to support tools and library resources. SNHU has a mind-blowing 27 different concentrations available in their superlative MBA program, so you just know that at least one of them was going to make our top lists. Truthfully, all of them are outstanding, but the real highlight is the operations and supply chain management concentration. With integrated Six Sigma preparation and a detail-oriented presentation of common supply chain management software packages, you get real-world expertise alongside high-level theory in supply chain builds and logistics planning. You’ll hit the gritty, warehouse-level topics of inventory control, transportation planning, and customer service standards along with the executive perspectives on finance, international business, and HR subjects. It’s a complete set of instruction in every aspect of business as it applies to the vital task of supply, shipping, and operations, and there’s no better place in the country to learn about it than at SNHU. Rowan’s Supply Chain and Logistical Systems concentration builds business executives who not only have the technical perspective and skills to conceptualize the value-added impact of logistical process improvement, but who also have the soft skills and management techniques to deal with labor and supplier negotiations. That critical blend of information processing, analysis, and deft resource management is a must-have combination in today’s business environment, and one that employers are constantly looking for. Rowan gives you the education you need to offer businesses true competitive advantages in supply chain optimization and management. Niagara’s College of Business Administration works hard to help students understand the current landscape of business in all of its MBA concentration tracks. Nowhere is this more evident than in the Global Business and Supply Chain Management concentration. Today, supply chains areglobal business. Schools that haven’t adapted to that reality aren’t give students the information they need to succeed in the real world. But Niagara goes past the basic theory of strategic supply chain management and jumps right into the important aspects of modern supply: international management, global sourcing and risk management, the elements of global transportation systems. A capstone course brings together each of those elements with the traditional basics of quantitative analysis, strategic accounting, and executive communications to shape graduates for genuine leadership positions in international business. Managing the flow of goods and services has become a lot more complicated with the globalization of almost every market over the past decades. While every business executive needs to know a little something about supply chain management, earning a specialized concentration will give you an edge in competitive job hunts with multinational corporations. The UNC Pembroke concentration sets you up to succeed in those situations with extra courses in MIS, supply chain management, and operations management. The education reflects the increasing use of technology to track and manage supply flows as well as the importance of structuring operational organizations around logistical realities. If you are studying supply chain management in this day and age, then you had better also be studying global business. There are few supply chains that don’t intersect with international borders today, which is why Kent State’s supply chain management concentration offers you a number of different opportunities to study abroad. At a remote campus in Italy or in Switzerland you can uncover the mysteries of EU regulations and commerce; in China you can learn the intricacies of negotiating factory and shipping contracts. Along the way, you’ll make great contacts both overseas and in the U.S. who will serve you well when you get your own career underway. Supply chain management is often called the lifeblood of the modern corporation, and as those supply chains have extended overseas and become more and more complex with modern shipping and tracking systems, they’ve started to required more skilled senior executives to plan and oversee them. That’s where supply chain management specializations come in to the modern MBA program, and DeSales offers one of the best. Starting with project management essentials, the skilled faculty will take you through forecasting, production, and inventory planning to plug you in to where those supplies are coming from and how sourcing affects every other aspect of the process. You’ll learn about strategic procurement and financial risk management before diving into logistics and value and quality management in the supply chain system. Together with the core MBA classes in marketing, finance, computing, and organizational management, you’ll have the full spectrum of both business and supply chain skills that will bring benefits to any organization. Penn State Harrisburg is a great school to pick for any MBA specialization, but there are solid reasons to choose it for a supply chain management track MBA. While almost every school pays lip service to the idea of global business and the necessity of managing supply chains in an international context, Penn State puts its money where its mouth is: two grand of support for you toward an international study tour where you will learn first-hand what the important aspects of global supply chain management look like. With a solid core in accounting, marketing, and other bedrock principles of business management, the supply chain track is particularly delicious icing on your executive education cake. Greater earning potential and higher-level positions in logistics, purchasing, storage and distribution and more are yours through Point Park University’s MBA in Global Supply Chain Management. In addition to gaining a deep understanding of today’s most relevant and critical business topics, you’ll investigate and explore topics related to global supply chains, international finance, global logistics, supply chain technologies, and more—all within a highly supportive, fully online environment. Thanks to convenient, eight-week courses, you’ll be able to easily manage your professional obligations while earning your MBA. You’ll also have outstanding opportunities to take your learning to the real world through optional internships and co-op programs. Excellence is a habit at TSU, and it’s one of the qualities that the MBA program’s supply chain concentration seeks to instill in students. Although you’ll drill down into the specifics of supply chain management, analytics, and logistics operations, you’ll also get a broad-based education in the elements that make business tick: accounting, finance, HR, and strategic planning. Understanding how those elements fit together with the supply chain gives you a leg up in knowing how business runs in the 21stcentury, with broadly distributed suppliers and just-in-time manufacturing processes driving efficiency. Preparing for a management position in any industry involves understanding how the supply process functions, and with a specialty MBA under your belt, you have an advantage over the competition. 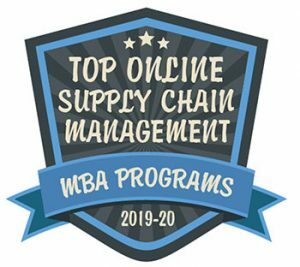 If you couldn’t already tell that the Haslam MBA supply chain management concentration was something special from the school’s Global Business Experience program, which puts you into the thick of the international business issues that dominate modern supply chains, then surely the fact that the supply chain graduate program is ranked second in the nation got the message across. The same courses and professors are the resources that the MBA supply chain management concentration has on offer, giving you the expertise and skills in national and international logistics to turn you into an expert at managing and evaluating corporate supply lines. As an executive with in-depth logistics expertise, you’ll be a valuable addition to any corporate management team in almost any industry. Texas Wesleyan recently revised their MBA program curriculum to make it smarter and smaller. Realizing that a key part of graduating quickly is to stay on track with your classes, the entirely online program implemented the high-tech Blackboard Learning Management System platform to streamline course access, and it offers only two specialty concentrations. Supply chain management is one of them, and it shows all the hallmarks of a concentration that has been well-designed and expertly presented. You start right off with a dive into supply chain management and global business, putting the concentration topic front and center. Along the way, you’ll hit all the other important MBA skills—critical thinking and decision-making, marketing and economic forecasting, organization dynamics—but at each stage you’ll find them tied in closely with supply chain management subjects to keep your head in the global logistics game even as you learn the ropes of being a proficient manager. Norwich’s Supply Chain Management and Logistics concentration approaches logistics from a very high, executive-level perspective. The strategic elements of supply chain planning and operations are taught from a management perspective, going into supplier relations, inventory strategies, parts management and distribution issues. Forecasting and learning how to deal with unexpected issues with a combination of flexibility, speed, and technology gives you an edge in the modern, globalized logistics environment. The Norwich concentration gives you tools such as conducting quantitative risk assessment and value assessments of supply chains and focuses on methods to optimize processes to create a responsive and efficient system. The week-long onsite capstone at the Norwich campus helps pull together all of those tools on top of the core MBA classes in accounting, finance, and organizational skills to give you a comprehensive business education that will have employers waving job offers at you even before graduation.